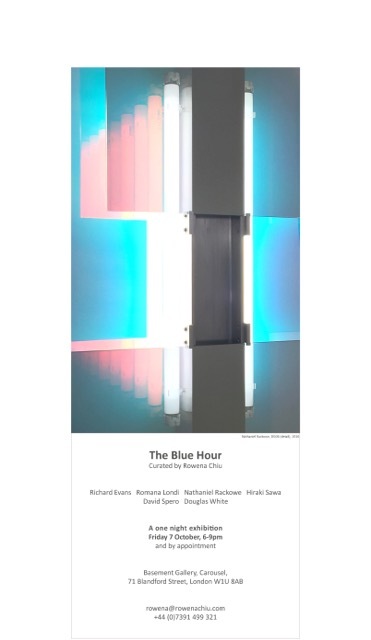 The title of the exhibition derives from the Blue Hour—the time of day moments before the sun rises and immediately after the sun sets where a blue hue imbues the atmosphere and it is impossible to determine whether it is day or night. Time is suspended and ambiguity and openness prevail. Romana Londi’s practice experiments with the permitters of painting. Encompassing abstract mark-making, gestural painting, performance, and sculpture, the works are conceived on the untamed recto-verso environments of unprimed cotton. Exploring dualities such as the intentional versus incidental and impulsion versus restraint through the processes of painting, dyeing, dripping, bleaching, and scraping, Londi’s ‘Happenstance’ series are sites of subconscious demarcation. A newly commission painting by the artist for this exhibition explores the concept of the blue hour.